Just a few things that I thought would your life a little more fun. 1 // The Perfect Straw Tote. Lindroth Design offers this practical and chic tote in an array of colors. Choose your favorite combination, add your initials and you are ready to go to the beach, the flower market, or the farmer's stand. They have them with long handles, short handles, a clutch and they even have a mini version. If you are not a monogram kind of a girl they also have the cutest straw bucket bag called the Birkin Basket. J'Adore! 2 // Monogrammed Napkins. Aren't these adorable? The color palette is really perfect for Easter, but also perfect for warm weather entertaining. 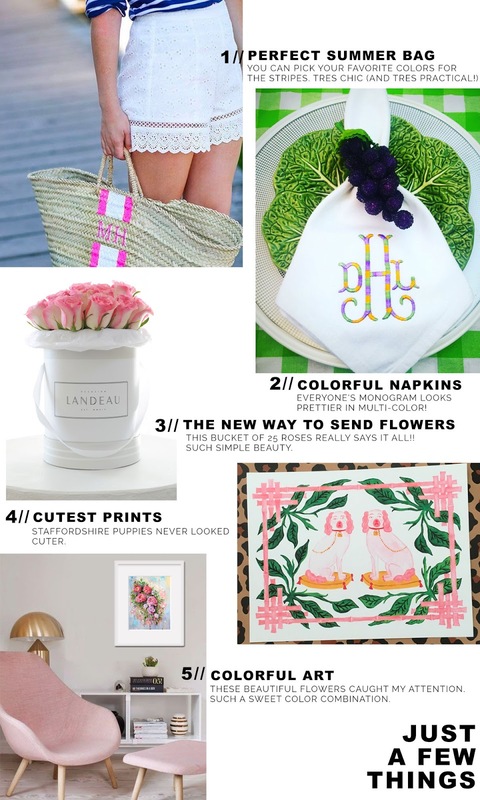 Brooke also has fun monogrammed banana leaf napkins that would look amazing out in the patio for a barbecue. 3 // A Bucket Full of Roses. Yes please!!! What a different way to send flowers! I'm just loving the simple and modern presentation of these Landeau roses. Pick your favorite color and send away! But currently they only deliver in NY, LA, Chicago and San Francisco. Don't worry I'm sure they will be coming to your neck of the woods soon. 4 // Doggie Prints. These doggie prints are an adorable addition to a desk, a lonely corner or a gallery wall. I'm quite smitten with this Staffordshire one, but she also has what I think are grey hounds and pugs. 5// Floral Print. This pretty floral print by Lena Navarro has the prettiest colors and so do all her works. They all have that thick paint feel, but the colors lighten it up. She also sells originals, which is always a favorite. It's always fun to get to know a new artist right? I love her art!! Her pieces are really affordable!